According to the American College of Obstetricians and Gynecologists (ACOG), healthy pregnant women can fly safely until their 36th week. The best time for pregnant women to fly is between weeks 18 and 24 since the chances of miscarriage and premature labor are both relatively low then. So if you’ve already made travel plans, you don’t have to rush to change them just because you’re pregnant, but read on for more information and helpful hints. Don’t be concerned about walking through the metal detector at the airport – it’s not an x-ray device, and it’s safe for you and your baby. Also, there’s no real risk of dangerous exposure to electromagnetic radiation from the sun while flying at high altitudes; the level of exposure under these circumstances isn’t significantly greater than normal everyday background radiation. If you’re flying during your first trimester and have been suffering from morning sickness, you may be particularly susceptible to nausea while airborne. Request an aisle or bulkhead seat when booking your ticket, just in case you need to rush to the bathroom. This is a good idea at any point during pregnancy since it’s likely you’ll have to use the toilet during the flight. Easy mobility is also recommended to avoid circulation problems, an issue for all airborne passengers and of added concern during pregnancy. Take regular stretching and walking breaks during the flight. Walk around the cabin, and flex your feet and roll your ankles while in your seat. Wearing compression stockings will help keep the blood moving in your legs, and always wear loose-fitting, comfortable clothing while traveling. Drink a lot of water to stay hydrated, even though this will mean yet more trips to the bathroom. 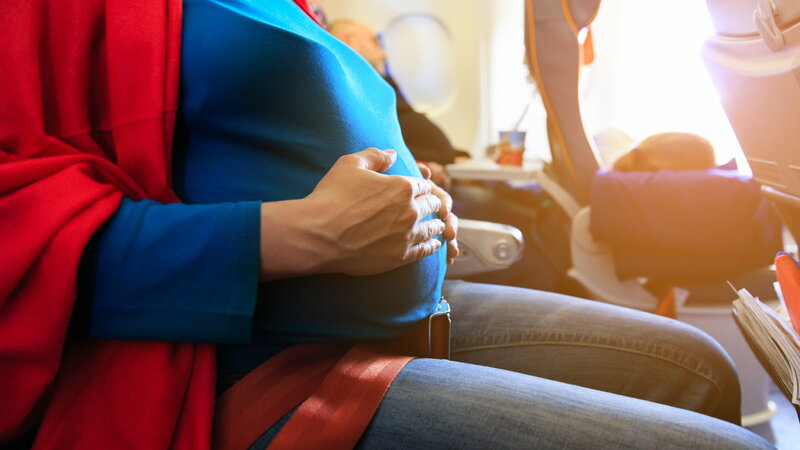 Unless you’re out of your seat to walk around or use the bathroom, the ACOG recommends that pregnant women keep their seatbelts fastened at all times, to be prepared if turbulence occurs. 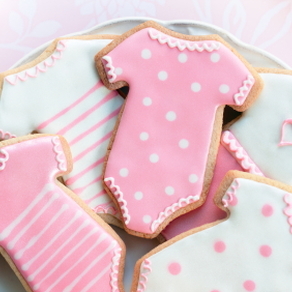 Even if you’re having a letter-perfect pregnancy, check with your obstetrician or health care provider, to see if he or she has any pre-flight recommendations or warnings. Once onboard, if you feel unwell or like you’re having contractions, notify the flight attendants immediately, in case arrangements have to be made for an emergency landing. A woman experiencing a high-risk pregnancy or one who has had any notable complications should not travel at any time while pregnant. Flying itself may be safe, but an airborne plane, miles from the solid ground (not to mention a hospital or doctor’s office! 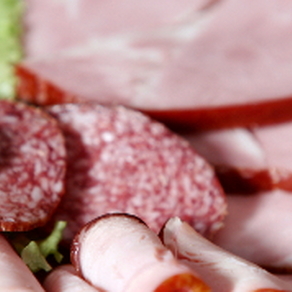 ), is not where you want to be should a problem occur. 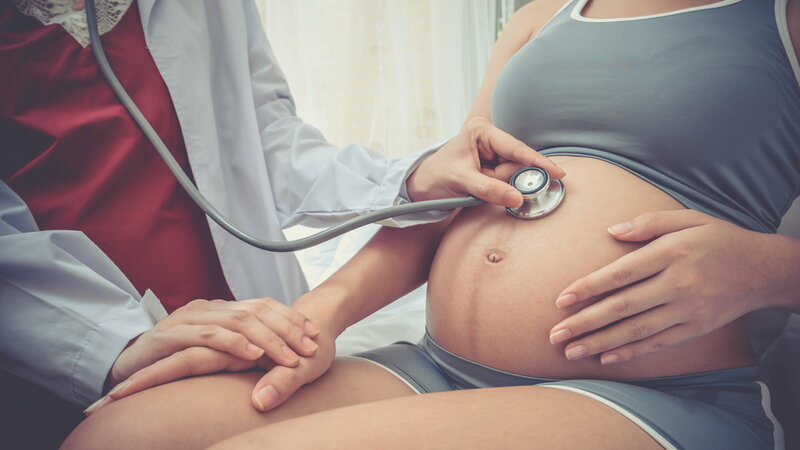 Pregnant women suffering from sickle cell disease, hypertension (high blood pressure), cardiovascular issues, problematic diabetes, severe anemia, or placental abnormalities should not fly, nor should a woman who is at risk for premature labor. Furthermore, once a woman reaches her 36th week of pregnancy, the ACOG recommends that she shouldn’t fly, as there is too great a risk of her going into labor during the journey. If you have to fly close to your due date, be sure to bring a copy of your medical records, in case something happens, and you should also ask your health care provider for a medical referral at your destination city. 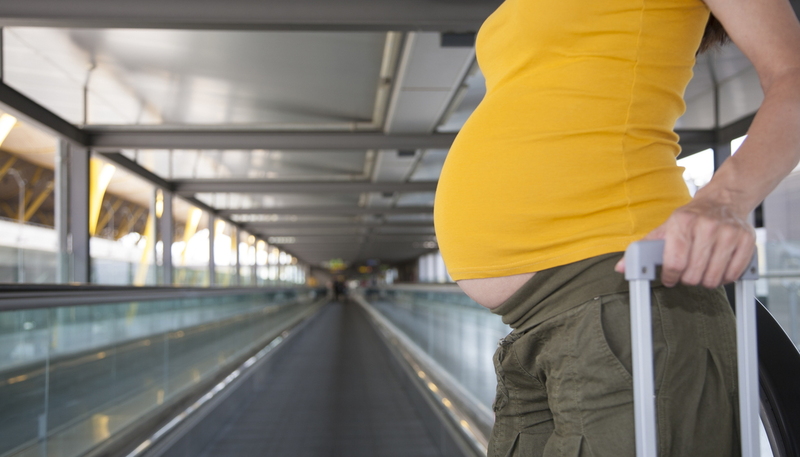 When making your flight reservations, check with the airlines, as some have their own restrictions about pregnant women. It’s possible that you might have to bring a “permission”-style note from your doctor in order to board the plane, so be sure to make arrangements to get one before your departure date.